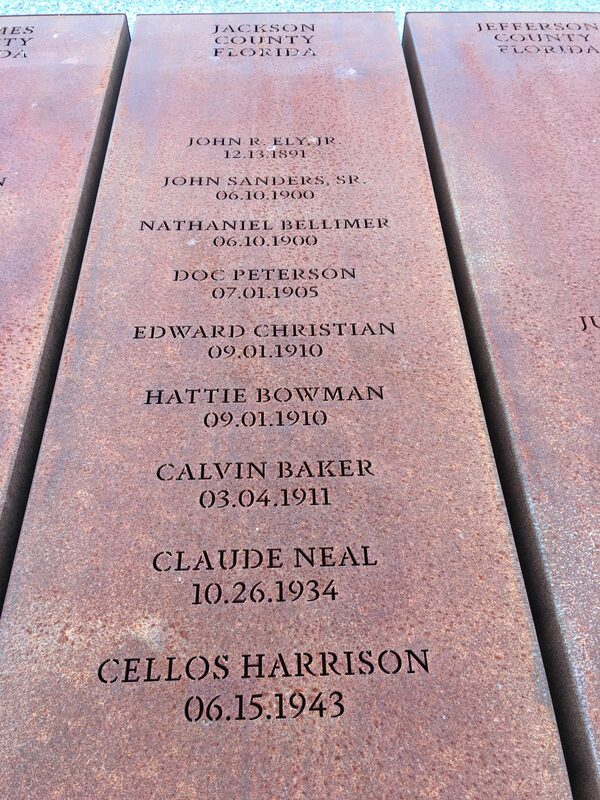 Atop a knoll in a six acre park in downtown Montgomery, Alabama sits the National Memorial for Peace and Justice. At first look from a distance, the profile of the building does not seem to measure up to the grandiose words of its title: The National Memorial. for Peace and Justice. But it does, and then some! Even though we got an early start in New Orleans, the drive to Montgomery was a long one, more than five hours, and by the time we found the site of the Memorial, it was just past 3:00 PM. Walking along the perimeter fence looking for an entrance somewhere, I wondered if in fact we had come to the right place. Where was the Memorial? Could that be it over there? I was not sure. The entrance to the park was quite modest, basically a one window ticket booth to purchase a ticket and two eight foot tables that were used by a security officer to check bags and purses. I had asked the ticket agent if there was food service inside and I thought she said yes, there was. Once inside I realized we had not understood each other. Yes, there were restrooms available right inside and to the left of the entrance but there was no food service available that I saw. My recollection may be faulty, but I believe the security officers at the entrance told us we could take photographs but the sculptures were not to be used as props for selfies, group photos, etc. The Memorial was sacred ground and was to be respected and treated as such. I will bear witness that it is sacred ground and all the visitors that afternoon thought so too. 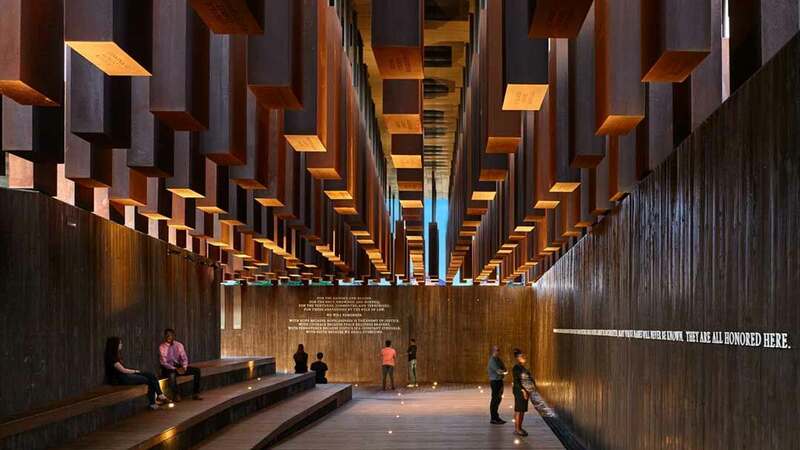 There is no doubt in my mind, the National Memorial for Peace and Justice was deliberately designed to keep all the attention focused on the visual presentation of one thing, and one thing only – lynching! Inside the entrance to the Memorial park, the vista is one of meticulously manicured grounds sloping upwards to the museum itself. The pathway leads to a remarkable Kwame Akoto-Bamfo sculpture that sets the tone for what the visitor will experience. You ask, what is slavery? This art piece shows you what it looks like! As you approach the museum building itself, you come up close to dozens of steel columns that are inscribed with the name of the county where African Americans were lynched, mutilated and burned along with the names of the victims and the year that each was murdered. All totaled there are more than 800 such columns in the museum itself and 800 replicas lying about outside the museum building waiting to be claimed by each of the counties involved in a lynching to create their own public monument at home. And now the pathway leads downward, again downward until we view all the steel columns high above our heads representing all 4400 lynching victims in the United States of America, including Kern County, California where I taught high school and worked with Cesar Chavez for many years. Now I understood, the Memorial is a subterranean building, which accounts for its low profile look from afar. MANY WHOSE NAMES WILL NEVER BE KNOWN. Aside from the unforgettable and dramatic visual presentation of our nation’s history of lynching African Americans, the rest of the Memorial is minimalist, subdued and a solemn presentation consisting of a couple of written pieces of documentation and a wall of rushing water seeking to cleanse our tragic history of white supremacy and its reign of terror directed against African Americans – lynching, mutilation, and burning. The National Memorial of Peace and Justice is beacon of hope that our nation might resolve its racial divide through restitution and reconciliation. Not in my life time for sure, but perhaps in that of my youngest grandchildren.